The more inventory you have, the more costly it’s going to be. Typically, the cost of inventory is around 10% to 20% of the asset value per year. One major airline mentioned that their inventory costs, even after outsourcing everything is 20%. If you have a million dollars of inventory on hand, and it sits unused for a year, you’re spending $200,000 just to have that inventory available. That’s a lot of money, but it covers warehousing, rent or mortgages, tooling, shelf space, security, and so on. Depending on where your warehouse is, maybe theft is also something you have to worry about. You’re spending time, effort and money--a lot of money--just to have that inventory on hand. So, how can you not invest so much in inventory, but mitigate your risk of not having what you need when you need it? Outsource your APU safety stock. Outsourcing your APU needs to a trusted material partner is a great strategy! If you’re outsourcing responsibility, then inventory isn’t carried on your books. Those millions of dollars in inventory can be reinvested into your operation, and you’re not losing 20% on expenses. Now, you don’t have to deal with it… as long as you have a trusted material partner. If you don’t, inventory becomes critically important. But if you do, outsourcing is a really, really great strategy. So, let's say you anticipate a need in the next six months for your APU. What if that need never materializes? You’ll be paying a lot of expenses to have one on hand that you don’t need. But if it does, your trusted material partner will have it ready when you need it (so you don't have to stock it for the next six months). Put that burden on them. That's their specialty. That's what they do. Your primary responsibility is to get passengers safely and to have revenue-generating flights so your operation can be profitable. When you’re dealing with inventory, be strategic with it. It’s a huge burden to just send out mass RFQs and start stocking left and right. 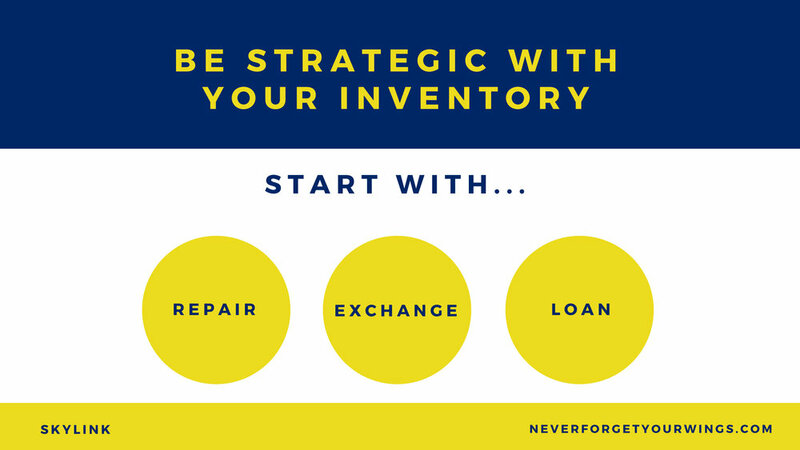 What are three tactics that support your inventory strategy? Start with repairs. Do you have unserviceable APU assets you can repair? Start by reinvesting back into those assets. Even better, with an MRO partner that will repair the asset and hold it (repair and hold). You’re outsourcing the repair, but you’re also outsourcing the financial risk and burden. If you need something urgent, do an exchange… either flat rate or exchange plus cost. As long as your APU isn’t a BER or incredibly costly, you’ll still save money on the exchange. You can also consider a 30 or 60-day loan. This is really useful if your trusted material partner wants the exact same unit--with the serial number--back. Send in your unit for repair, get that unit back, and send the loaner back to your trusted material partner. Loans can be a great option to help you mitigate some of the total cost. Start with these three things--repairs, exchanges, and loans--before you go on the market and buy an APU outright. ﻿If none of that makes sense for your operation, then start processing at an outright price. Whatever you do, be strategic in your stock purchases and think about the near-term and long-term impact inventory will have on your finances.